Dance is part of the human condition. It’s physical expression at its highest form, and everyone can do it. Tapping into that joyful expression with dance lessons for your children is an amazing way to help them grow. Star Bound Dance Company in Alberta believes that our dance lessons help your child become the happiest and healthiest version of themselves. Here are some of the benefits to attending dance classes that we’ve identified. We don’t often think of dancing as a rigorous activity, but it’s an excellent and, more importantly, fun way to exercise. Children who take regular dance lessons see increased flexibility, a better range of motion, and increased physical strength and stamina. The repetitive and expressive motions of dance improve musculature and posture, and increase balance and coordination as well. Each lesson provides your child with a creative and engaging way to exercise. Not only is dancing great for a child’s physical health, it’s great for their social health as well. Dancing is a highly sociable experience, and this is true for dance lessons as well. Through dance lessons, children learn valuable skills, like working as a team, developing trust between peers, and communication and cooperation skills. Children make new friends at each lesson, and lifelong friendships can blossom in the dance studio. Often, parents with shy children find that their child comes back from their dance lessons brimming with a newfound sense of social confidence because of the skills they’ve learned. While dancing is a great way to get moving and express yourself, it takes a lot of hard work to master the skills and positions that dancing requires. Dancing requires regular practice, discipline, and focus. These are skills that can extend beyond the dance studio and be useful in the classroom and at home. Numerous studies have shown that children who take dance lessons perform better in the classroom because they bring those valuable focusing skills with them. Dance lessons also help children develop an appreciation for other disciplined and focused fields, like art, music, and theater. Through dance, children are given opportunities to develop an appreciation of their body and how it moves. This leads to a great sense of self-confidence in their appearance and their abilities. Dance also helps children develop a sense of ease about performing in front of audiences and groups. Of course, Star Bound Dance Company creates a positive learning atmosphere, so students feel safe to take risks, push their boundaries, and celebrate their success and their shortcomings. The result is a student who feels more at ease with themselves, their abilities, and their interests. Dance lessons can benefit any child, and the benefits go far beyond the handful we’ve listed here. If your child is looking for a fun, new creative outlet, consider signing them up for dance lessons with Star Bound Dance Company in Alberta. 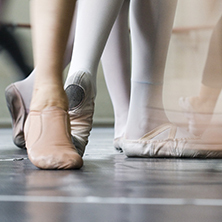 Our dance studio offers lessons in ballet, tap, jazz, and contemporary dancing. Call today to schedule lesson for your child.